A lovely keepsake of their special day. 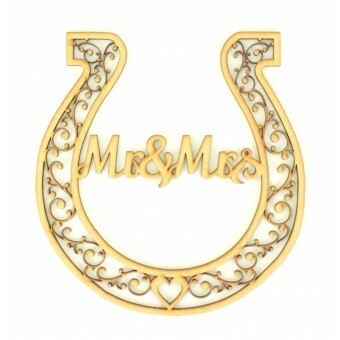 Mr&Mrs linking in the center of the horseshoe. Beautiful swirl detail around the horseshoe which finishes the design perfectly. This design looks beautiful left as mdf or can be painted to suit your wedding colour scheme. Finish with ribbon or twine to hang the horseshoe.